After every major Google algorithm update comes the inevitable question, ‘How does this affect the SEO tactics I’m using?’ With Google scattering minor algorithm updates around the major Penguin update, this question becomes more difficult to decipher. Avoiding black hat tactics is the easy part, but what about the gray hat tactics that could lead to your website to being penalized? Many webmasters don’t realize the effects of these updates on their anchor text and linking strategy. 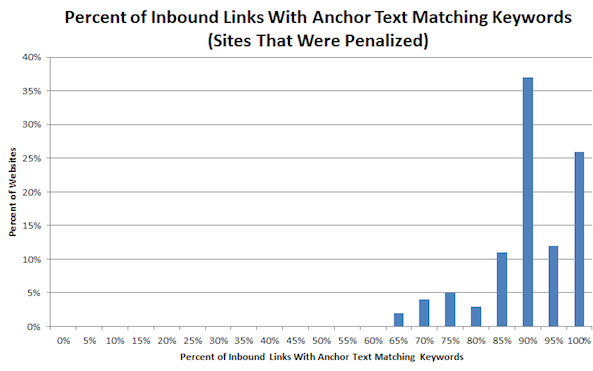 If you’ve focused most of your effort on promoting exact match anchor text (your exact keyword phrase), you need to read this article and adjust your strategy immediately. On the other end of the spectrum, websites with more natural looking backlinks didn’t see decreases in their rankings. While not explicitly mentioned by Matt Cutts, its apparent Google adjusted its rankings by discounting links it considered to be artificial. Microsite Masters also found that websites with few inbound links from other websites in the same industry saw decreases in their rankings. This isn’t much of a surprise considering Google’s attitude towards rewarding high quality and relevant links. And in all fairness, creating a website with valuable content often attracts links from other quality websites within the same industry. Not only is this a good indicator of your website being relevant to your target keyword, it obviously this is harder to manipulate than other link building methods. 1. Evaluate your link profile. Open Site Explorer and ahrefs will help you identify low quality links for you to remove. You should perform this evaluation every month. 2. Make Natural anchor texts your new best friend. If most of the anchor text pointing to your website are exact match anchor text, then you’re walking on thin ice. Linking to the same URL in all your content will land you in hot water as well. You need to mix up your anchor text so you don’t have so many unnatural exact match anchor text links (aim for 30-40% max). Use your company or brand as the anchor text on your website. And I know you don’t want me saying this but “Read more” or “Click Here” need to make a more frequent appearance in your anchor text strategy to create organic looking links. To add some SEO value into these anchor text you can occasionally include additional details such as “Click here for more details on [description of product/product name/targeted keywords]”. 3. Use varied alt and title keyword attributes. Avoid editing your alt or title attributes with keywords that help with SEO but offer little explanation for the user. For example, you might have placed the same target keywords in all your alt or title attributes for images. Make sure they describe the image and don’t always include exact match target keywords. Instead of using ‘SEO Software’ for an image, I might use ‘Software To Help Increase Search Rankings”. 4. Avoid too many site-wide links. This includes having all pages on another domain link to one URL on your website or linking to another domain from every one of your website pages. Often these types of links are inserted into footers or sidebars and then forgotten by Webmasters, so check to make sure you don’t have too many site-wide links or you will be penalized. Simply target different URLs on your domain if you have already targeted the same URL many times. 5. Create valuable, fresh content for users not search engines. Yes, you’re drowning in warnings from every angle to create valuable content for users. But I’m also a firm believer in optimizing your content to be found by the search engines without being penalized for it. So here’s a simple strategy you can use to ensure your content helps promote your target keywords without getting you in hot water. I recommend you make a list of all your target keywords and write 10-20 possible topics around related keywords or just one target keyword. For example, if one of my target keywords is “Twitter tools”, I could write a topic on the importance of engaging with Twitter followers. Then include a few lines about how Twitter tools can assist you with this task. Write at least 1 article per week, depending on your schedule so you always have fresh content. After your article is complete, appropriately optimize afterwards. Remember, search engines will detect unnatural content including unrelated anchor text and alt tags and too many hyperlinked target keywords.Only include your target keyword 2-3 times throughout the article and rotate between different sets of keywords (don’t always include the same 3 keywords in one article, mix it up so different sets of keywords appear in different articles) or even use just one target keyword at a time. Also, don’t just hyperlink your target keywords with your website URL, include links to other content the user may find useful such as previous related articles or studies conducted. 6. Now spread the love. Post the content on your own blog and submit for guest posting on related websites, ensuring the entire article only appears a few times across the Internet to avoid duplicate content violations. This is a great way (and possibly one of the last remaining ways) to create quality do-follow backlinks to your website from authoritative websites in your niche that don’t anger the Google gods (and you get greater exposure for your content!). If you’re unsure if your article has been posted on other websites without your consent, check out Copyscape. Then submit a DMCA report through this Google page to request the content be removed. Now continue to post snippets of your content and the relevant link on your social properties such as Facebook, Twitter, Digg and so on. As always, remember to post on your Google + profile to create more quality do-follow backlinks. Keep in mind one of the minor updates for April was that there would be “No freshness boost for low-quality content. [launch codename “NoRot”, project codename “Freshness”] We have modified a classifier we use to promote fresh content to exclude fresh content identified as particularly low-quality.” So don’t upload new content to your website or blog if its of low quality, it won’t benefits you SEO-wise and might leave you penalized it will discourage visitors from returning to your website! I’d say most, if not all website owners promoting their business online are guilty of using too many exact match anchor text. I personally don’t see why exact match anchor text are so offensive to Google as long as it remains relevant to the content. But this isn’t a democracy so I suggest you adjust your strategy or you can be sure that Google will come after you sooner or later.